Can Cut Watermelon Last Unrefrigerated? Traditionally a summer fruit, watermelon can be found year-round at most grocery stores. 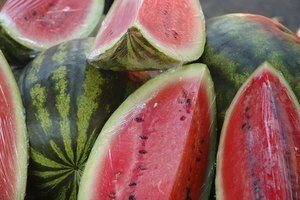 Up to 92 percent of the fruit is water, and good watermelons are juicy, with a clean, crisp texture. 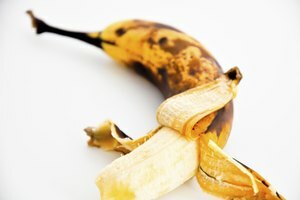 The moisture level, taste and texture of the fruit suffer if you don't handle it properly. 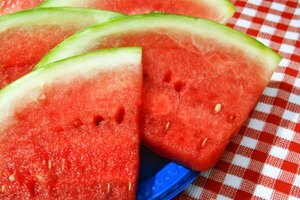 Additionally, cut watermelon can harbor microorganisms that cause food-borne illness. While home cooks typically follow safe-handling procedures for meat and dairy products, produce is often overlooked. Unless you buy pre-cut watermelon, the safety of your cut watermelon begins with how you prepare it. Wash your hands and any cutting boards and knives you'll use to cut the fruit. Rinse the watermelon in running tap water. Then, scrub the rind with a produce brush. Dry the melon off with clean paper towels to remove any remaining dirt or microorganisms. If the surface of the melon and all of the kitchen tools that will touch the melon are clean, harmful microorganisms will be less likely to transfer to the fruit when you cut it. Sliced melon, including cut watermelon, falls into the category of Potentially Hazardous Foods, as defined by The Washington State Board of Health. With this type of food, you must pay attention to storage time and temperature to control the growth of potentially harmful bacteria. Cut watermelon, both pre-cut chunks and slices you make yourself, must be stored in the refrigerator. 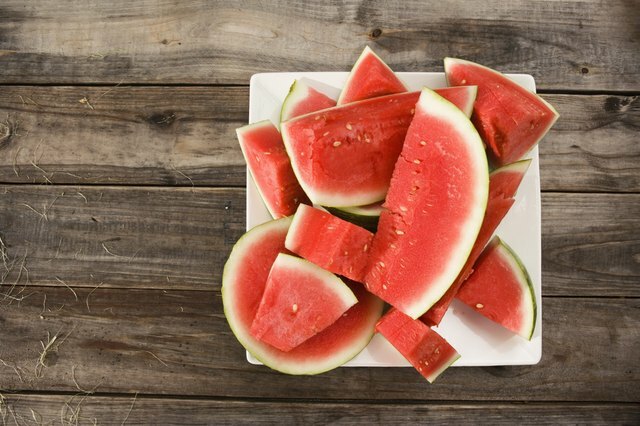 Bacteria multiply quickly when you leave cut watermelon in the "danger zone," between 41 and 135 degrees Fahrenheit. You can leave the watermelon out for two hours and still safely eat it. If temperatures in your home or in the area where you're serving the watermelon rise above 90 degrees Fahrenheit, you need to get the watermelon into the refrigerator within one hour. When you place your cut melon in the refrigerator, make sure it's covered with plastic wrap or inside a sealed container. To enjoy high-quality watermelon, eat the pieces by the next day. While the quality will suffer slightly, the cut watermelon will be safe to eat for three to four days. Refrigerating cut watermelon also preserves its taste and texture. Cut watermelon tastes best when it's served right out of the fridge. 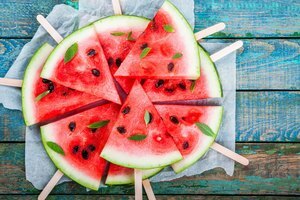 In fact, the National Food Service Management Institute recommends putting a whole watermelon in the refrigerator 24 hours before you cut it, so that the chunks will be chilled and ready to serve. What About Watermelon? : Ask the Experts -- How Long Will My Watermelon Last? 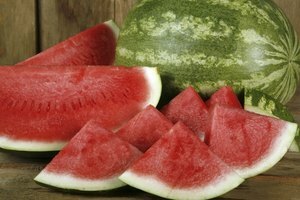 United States Department of Agriculture, Food Safety and Inspection Service: "Danger Zone"
Why Does Watermelon Get Grainy Inside?